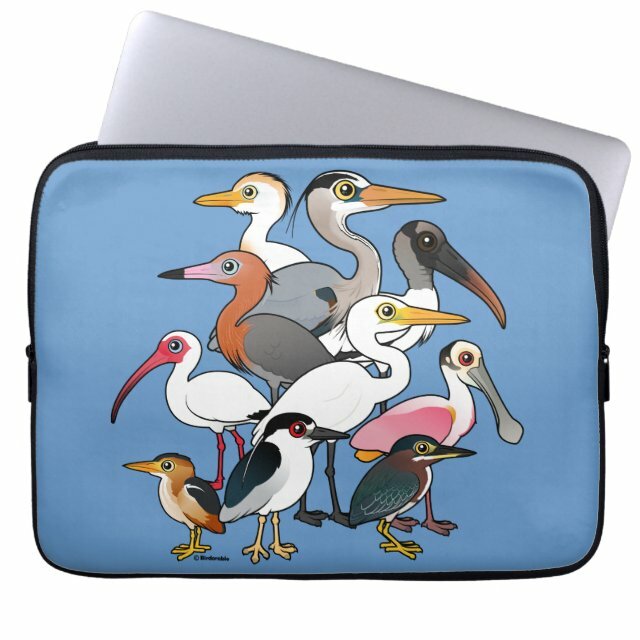 This cute original design features cartoon images of ten different North American wading birds. Cattle Egret joins Great Egret, Great Blue Heron, White Ibis, Least Bittern, Black-crowned Night-Heron, Reddish Egret, Wood Stork, Green Heron, and the pinkest wader, Roseate Spoonbill. You can customize this gift! Move the birds around, change the product color or style, add text or images -- make it your own! If you'd like to see this Birdorable wading bird design on a different product not currently available, please send us a message and we can make the product available in our store. Protect your laptop with a custom laptop sleeve. Made with 100% neoprene, these lightweight and water resistant sleeves look great with your photos, text, or designs. Great for travel or just day-to-day use, custom laptop more... sleeves come in three sizes to fit your device and your style. Sizes for 10 inch, 13-14 inch, and 15-17 inch laptops.